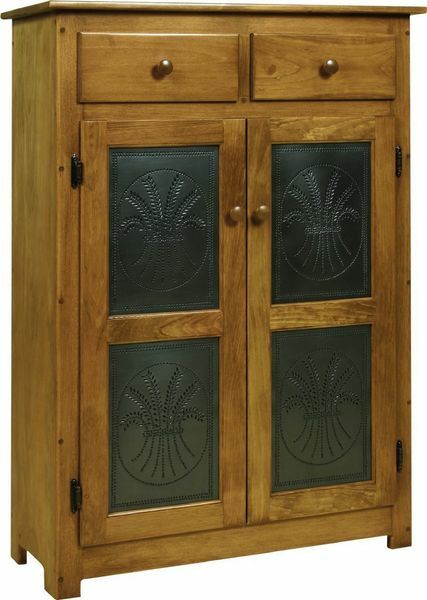 Authentic, helpful and charming, the Pine Wood Pine Safe with Optional Hand Punched Tin Doors is a beauty. Offering two cabinet doors that open to reveal two adjustable shelves and two drawers, this handy storage cabinet adds a huge dose of solid wood charm wherever you choose to use it. The first pie safes were strictly for protecting food from rodents and bothersome insects. Today they are treasured antiques used for storage. Our Amish craftsmen make beautiful pie safes that are sure to become one of your favorite pieces of furniture to use. This wood pie safe is made with solid Eastern white pine wood. It's a bit softer than other woods and is easy to paint or add distressing to for that aged look that hints at antique. The wood grain of pine wood makes it a great candidate for painting, which cannot be said of all other hardwoods. Gorgeous solid wood furniture made from pine enhances any room and it's offered at a lower price than other woods, making it even more loveable! Punched tin doors on early pie safes served as ventilation and added decoration to this kitchen furniture staple. With this pine pie safe you have many options, including keeping it solid wood or adding punched tin doors. Several designs are offered for the tin, including copper stars, copper wheat and choice of light or dark colored tin. We thank you for taking the time to shop with us today. This pie safe is part of the Heritage Pine Collection and it ships free to anywhere within the continental United States. Select options online or for more personal service, our Furniture Specialists are happy to assist you. They can be reached by email at Questions@DutchCrafters.com or Toll-Free at 866-272-6773. I recently purchased a pie safe from you which arrived on Friday, Jan. 8th. It is beautiful and all that I could have hoped for, particularly for the price I paid. I am very pleased with the furniture. Thank you. I recently purchased (Item 2668) Amish Pine Pie Safe with Hand Punched Tin Doors and received it to my home. It is so beautiful I love it. Truly the most beautiful piece of handmade furniture I own. I am so happy and I love my piece. Hi Mimi, The pie safe cabinet was beautifully packaged, and we love it. I will recommend your service and product to others. Thanks!